The below opinion was done up hastily in response to the article on plankton bloom in Pasir Ris. There will be no extensive research figures given to support this article as the author strongly believes that credible experiences that engage are far more reliable than figures in a modern world. 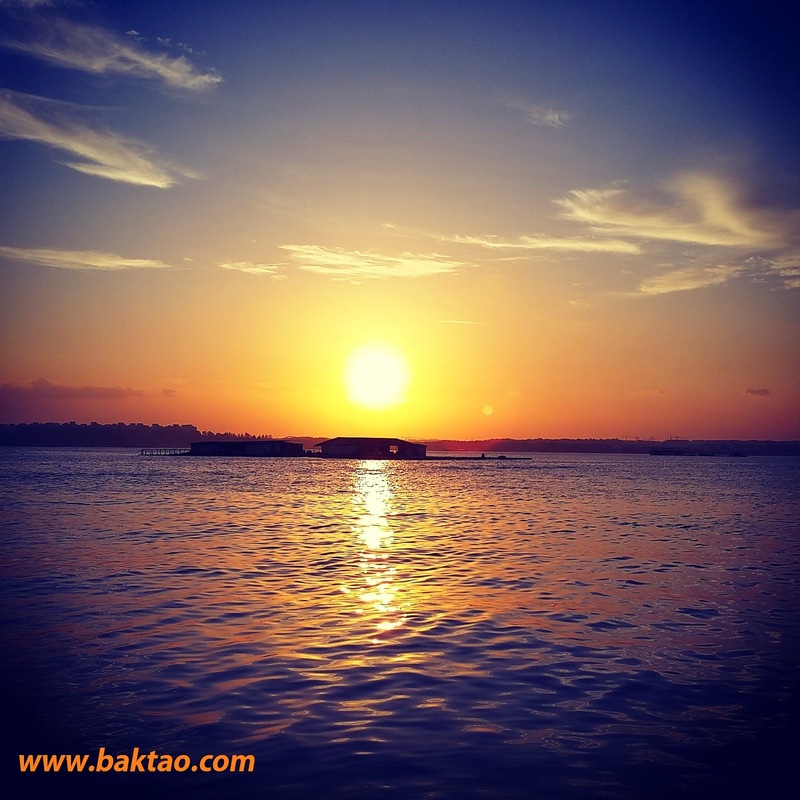 In addition, figures on fishery and fishery research are fairly limited in Singapore waters. This opinion should not be taken as a scholarly article or reference but merely as an abrupt ranting with regards to a recent issue. After yet another plankton bloom which sent the fish farms reeling (pun intended), it’s clear that Fish Farming in Pasir Ris needs to be reviewed. How long does the government intend to nurture such a venture? In this opinion, I shall share some personal experiences (in the tiny shoes of an angler) that may come as a surprise to many whom are not on the ground. Sustainable farming should always be taken as a way to provide food to the masses such that everyone would be able to afford a simple meal of cooked fish. Sustainable fisheries such as Salmon, Cod and even Shark’s fin are now gaining traction and while that is commendable, what does fish farming in Singapore really focus on? Although I run the risk of burying myself in with my theories, I would very much like to think that we farm fish in Singapore simply for their inflated value to certain groups of people. For example, much energy and effort is spent breeding species like Groupers and Seabass to be sold to restaurants because they are highly demanded by those who can pay premium prices especially during Chinese New Year. Would Singapore fish farms that are only focused on Seabass or Tilapia (although freshwater context) do well? I’m not too sure of that. When we think of fish farming, most anglers think of it as a boon because the common thought is this – With the fish farms supplying fishes to the market, wouldn’t that mean there would be more fishes in the wild to catch? When I hear about this, I would go on to share what I would call “nirvana in fish farming”. Many fish farms do not simply produce bumper stocks by growing organically… They do so by feeding their fishes with feed that have growth hormones or they use “Super fish” or “Super KBLs”. These super fish grow very fast and sometimes have physical abnormalities (due to farming conditions). In fact, while talking to an experienced fisherman in Changi, I found out that Super KBLS lose their ability to breed because of their diet. You may think that it’s ok, we probably won’t die from eating such fish but think of the damage they could possibly do to wild fish gene pool if they escape. There is already evidence of farmed salmon escaping and causing havoc to wild salmon gene pools because of their weaker genes! But wait because there is more to the story… In order to maximize profits, some fish farms put out nets all around Pasir Ris waters to catch any sea creatures such as fish, squid and crab. The undersized fish (such as Snappers and Grouper) are released into their nets for them to grow bigger and more profitable while the bait fishes are fed to their farmed fish. After this, we’re left with the undesirable fishes such as catfishes and I found out they sometimes put all these fishes into a giant grinder and then feed the chunks to their farmed fish! I actually found this out when I was fishing near a fish farm and the owner told me to give him the catfishes that I caught (I initially wanted to release them). The list of unethical fish farming goes on and I have more examples that I do not share. The question is can this unethical arm of farming help our local fish stocks or can it even sustain itself? Can you visualize salmon farms breeding their own salmon and yet go around plundering the surrounding baitfish (that the wild salmon depend on) or catching wild salmon? There are so many theories surrounding fish farming much of which isn’t even proven elsewhere much less in Singapore. There are so many ideals that we should conform to such as “Energy required to farm x fish”, “Affordability of x fish”, “Environmental impact of farming x fish”, “Energy lost by farming x fish instead of x fish” and although I wouldn’t discount the growing interest of marine biology research in our waters, I hope someone out there is better informed of fish farming in Singapore. Every lunar new year I would set aside some time to catch some fish and it seems that I still have it! 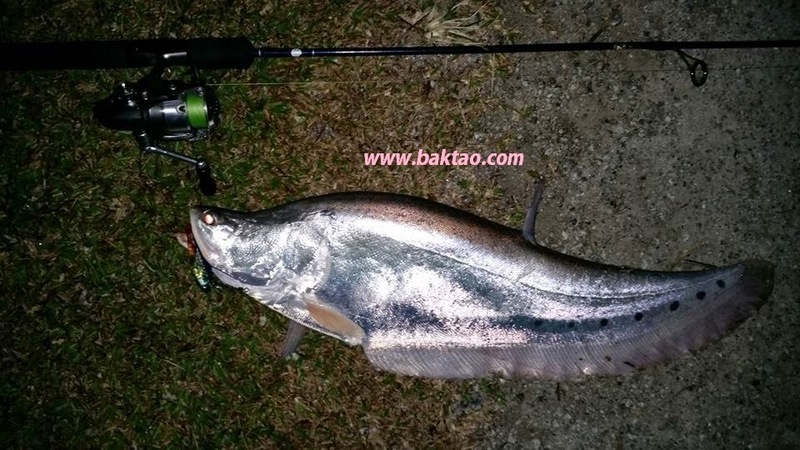 Although it was a slow and windy night, I managed to hit this juvenile Belida on white rabbit rubber lure while luring at the Pandan Reservoir legal area. 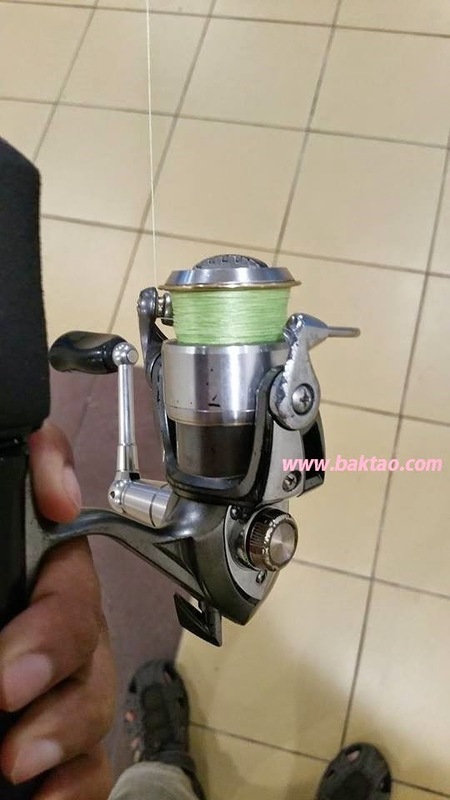 Reel used to bring up the fish was my 10 year old Daiwa Caldia Kix 2000 which has been with me forever and catching fish for me even till this day. Spooled 6lbs Suffix 832 on the reel and paired it with a Shimano Bassrise 4-8lbs. It was really pure luck as earlier on I had another similar sized Belida chase my lure (Zman super tough ghost shad) all the way to the jetty platform and turn away at the last minute. Awesome to hit CNY fish! 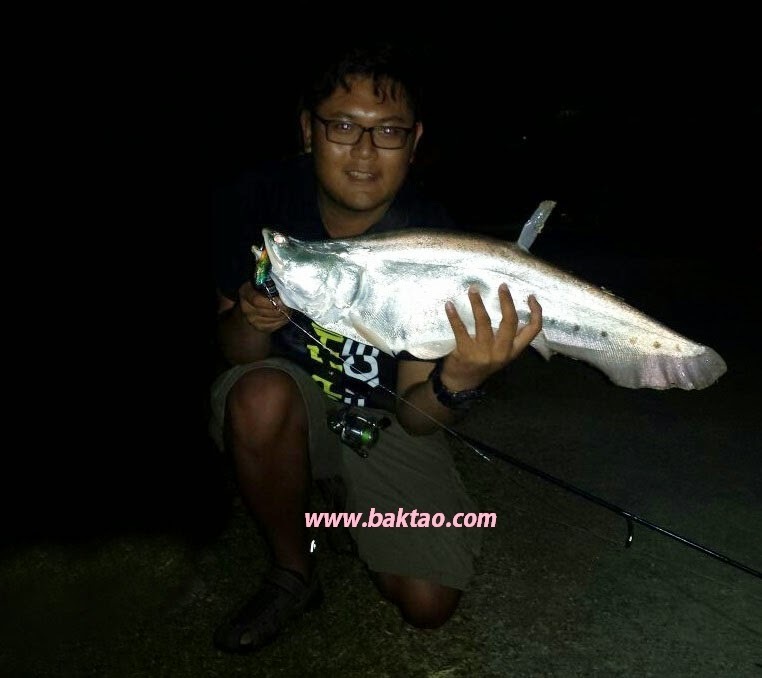 Pandan Reservoir though over fished, is still producing some good catches for all the lurers in Singapore and hope this continues!